If your looking for a pre-built Lin (Linux) Box, look to Koobox from Mirus, the first-ever line of desktop computers offered by a major OEM to exclusively run Linux. For some reason many people still think that Linux desktops are the domain of hobbyists and geeks. Not true. The fact that Mirus has devoted an entire brand to desktop Linux shows just how much ground Linux is gaining. Three versions of the Koobox are available, giving consumers the option to pick the PC that's right for them.The mid-tower case is a silver and black design. It includes front access to USB ports and a headphone and microphone jack. -For $299, you get the Essential Koobox that is just right for basic computing that comes complete with CD-RW drive, 5 USB ports, including a convenient front-side port, Internet keyboard and optical mouse, and 2W speakers. Inside, the machine they hook you up with an AMD Sempron processor, 256 MB RAM, 40 GB hard drive, and onboard video and sound . -Then there is the $399, Multimedia Koobox, which features the Essential Koobox specs plus DVD movie player software, a 16x Dual Layer DVD+RW drive, 512 MB RAM, and 160 GB hard drive. -Last but not least, for $499 you get the Performance Koobox which adds a super-fast AMD 64-bit Athlon 3000+ Processor. 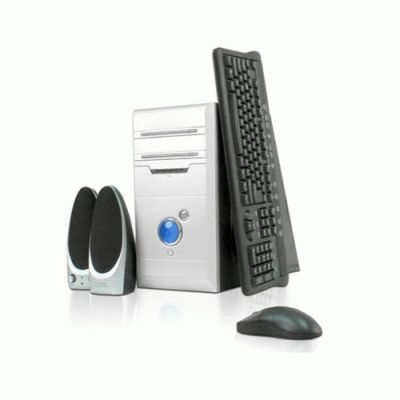 All machines come with the full Linspire 5.0 operating system, including OpenOffice.org office suite, which has become the main Linux-based competitor for Microsoft Office. It will display most Microsoft formats and the move to open XML formats as the default for the next version of Microsoft Office will only help interoperability - even though Openoffice favors a different XML schema: Oasis Open Document Format (ODF). You get virus filtering (mostly for window base virus) and Web protection software. Linspire calls their product the world’s easiest desktop Linux. I cannot disagree. Of the different distributions of Linux that I’ve tried in the recent past, Linspire is, hands down, one the easiest to configure and use. For my money I would go with the $399 Multimedia Koobox; mind you $399 does not include the price of a monitor. Here's Rebel Said's review of Koobox....You might expected that the Koobox would use relatively cheap or no-name components, given its price, but you would be wrong. The system includes an ASUS K8V-MX motherboard with integrated S3 Graphics UniChrome Pro IGP (no 3D acceleration) video and sound. The motherboard accepts AMD socket 754 CPUs and has a 4x/8x AGP slot. The multimedia configuration ships a 7200 RPM 160GB Seagate Barracuda 7200.9 ATA hard drive and Kingston one 512MB DDR DIMM chip ( The system is capable of handling up to 2GB of RAM, according to the motherboard specs ). Be warned by default when you purchase a Koobox with 512MB of RAM, you're only getting 448MB of RAM for the system ( you can reduce the amount of RAM used for the integrated video in the BIOS ) . I must dispel a myth... Linspire 5.0 “dose not” require you to run as root (administrator). As I said Linspire is, hands down, one the easiest to configure and use. It is configured to look and act a lot like Windows, and inexperienced users shouldn't have much trouble finding their way around the KDE desk top. It includes a good selection of software for basic productivity tasks and for normal desktop use. Users have a media & MP3 players, instant messenger, CD and DVD burning. ( Once you register with Linspire, you can download a DVD movie player for your Koobox ) The 5.0 operating system supports Java , Macro media Flash, Windows media, Divx, older QuickTime movies and so on. A must since many users are going to want to watch videos in those formats. Synaptic can be very user-friendly but CNR fits more the online shopping model that consumers are used to. You *can't* buy/downlode commercial products using Synaptic, however the CNR Service has many pay-for software titles on CNR like Star Office 8, Cross Over Office 5, and Win 4 Lin. You don't "need" to be a CNR subscriber to purchase "commercial products" with one click, so anyone could buy the Cedega, but they do offer discounts to subscribers. Without CNR an inexperienced Linux user would have to visit some other online shopping website just to get the program and install it themselves. I'm sure those who need propriarity software in say Ubuntu would appreciate an easier way with the CNR client. Linspire 5.0 also includes dialers for several ISPs, which is a cool feature for home users who connect to the Internet through Earthlink, NetZero, AOL, or other dialup service providers. You cant go wrong with this Lin Box. Ordinarily its a fuss to set up DVD playback, much less finding a legal DVD movie player for Linux. Not true here, once you register with Linspire, you can download the DVD player for your system with a single click. With CNR you can install more than 2,000 “free” Linux software programs direct from the CNR Warehouse . Just click the software you want and it installs on your computer and is ready to run. If you need more Graphic power you can purchase an AGP NVIDIA PCI card for 3D acceleration. If you still need Windows, no problem Dual-Boot, remember theres a 160 GB. For those who hate Linspire with a passion, they can install most Linux distributions on the Koobox .